Jewish students praying at gates of Temple Mount on Tisha B'Av forcefully removed by police despite not breaking any rules. Police removed dozens of worshipers from Yeshivat Torat Hayyim from the Temple Mount gates on Tisha B'Av Sunday, claiming that their prayers could provoke riots and rioting by Muslim local visitors. Attorney Menashe Yado, who represents the worshipers, wrote to Internal Security Minister Gilad Erdan asking him to change the enforcement policy of the police. 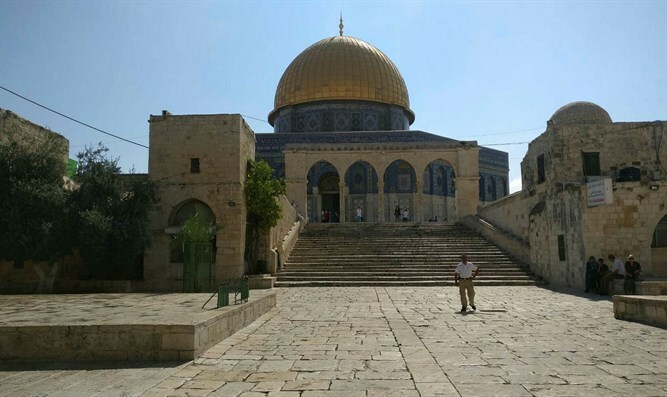 The letter sent to the minister describes the event, during which a group of students from Yeshivat Torat Hayyim arrived from the Binyamin area in Samaria to pray at at the gates of the Temple Mount on the day of the fast of Tisha B'Av. The worshipers were wearing tefillin and prayer shawls, and they were praying loudly when the police decided to remove them from. They were removed for a distance of hundreds of meters while the police used forced to ensure their movement to another location, even though they did not violate any laws. The letter further states that "the determined support of the police for the prayer of Jews outside the gates of the mountain will inform the Muslim public that the Jews have rights in the Old City and will enable the Jews to realize their national, religious, constitutional and elementary rights." The letter further claimed that the purpose of the police was to prevent unrest in the area, but the public removal of the worshipers conveyed a message to the Muslim public that Jews should not pray at the gates of the Temple Mount. The letter included a condemnation of the manner in which the police acted during the incident. "The police acted in a pattern ... which created unrest between the worshipers and the policemen, where it would have been appropriate to contain the Jewish prayer and create a positive atmosphere." The letter asked Minister Erdan to ensure that the proper lessons were learned from the incident and that "a policy will be formulated with proper weight to the Jewish rights to realize their national feelings and freedom of worship at the gates of the Temple Mount." Attorney Menashe Yado of the Honenu legal organization noted: "Minister Erdan announced when he entered the Knesset that he intends to strengthen the Jewish hold on the Temple Mount. He promised and acted. During his term of office, the policy changed and became a policing policy that recognizes the fact that the Temple Mount is in our hands and gives substance to this fact, while respecting the status quo on the one hand and respecting the rights of the Jews on the Temple Mount on the other." Yado explained that the purpose of the appeal to Minister Erdan is "to draw his attention to the fact that outside the gates of the Temple Mount the norms dictated do not exist, and Jews cannot pray there properly, not even on Tisha B'Av, which is a clear day of prayer. We hope that Minister Erdan will continue with the positive and correct trend he created on the Temple Mount, and will work to allow Jews to pray outside the gates of the Temple Mount." "We hope that our letter to Minister Erdan will draw his attention to the fact that the Israel Police, in our view, out of fear of violence by extremist Islamic elements, has not allowed dozens of Jews to pray a prayer outside the gates of the Temple Mount on Tisha B'Av.